There’s this thing about the new house I can’t handle, and that thing is landscaping. Don’t get me wrong — the landscaping itself is b-e-a-oootiful (the previous owners had it professionally done #fancy), but you guys, it scares the crap out of me. Maybe it’s because I tried my hand at growing my own herbs for the first time this year and I failed miserably with the basil, but I’m terrified I’m going to wake up one morning and all the plants/pots/flowers/bushes/grass are going to be dead. I’ve had nightmares about it. In other news, my husband thinks I’m insane. I can’t say I disagree (Type-A maniac, right here). Here’s the kicker: We have an in-ground sprinkler system and these little drain spouts that go directly into the potted plants, so the whole thing takes care of itself. And yet I’m still sitting here, biting my nails as I stare at the landscaping praying it won’t die on me just when the old homeowners decide to stop by and question who these lunatics are to whom they sold their beloved, perfectly landscaped house. I know this all comes across as a humblebrag, but I’m seriously not trying to make it so. If it were up to me, I’d have one tree and one pot of flowers in the yard and a garden gnome figurine and that’s it. But that wouldn’t look as nice. So into the landscaping fire I go. But enough about my crazy paranoia over outdoor decorating. Let’s get to the tacos. Tacos are not at all like landscaping, you see (ah, yes, the awkward segue). They are a tried-and-true staple for me and my house, and they are much, much easier for me to handle. And I get to eat them, unlike my dead basil. 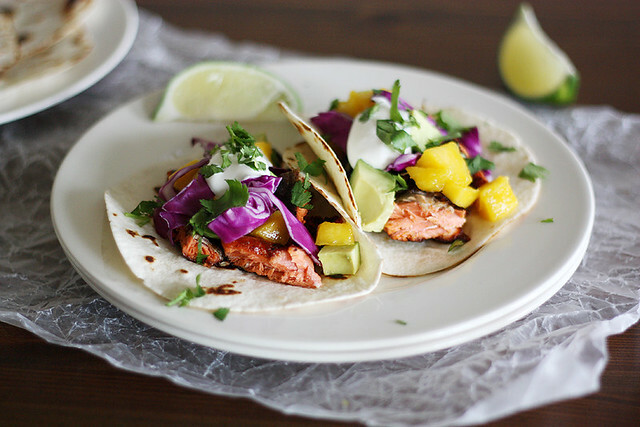 I made these salmon-mango tacos as a way to fancy up my normal taco routine. Ground beef tacos = pot of flowers and a garden gnome. 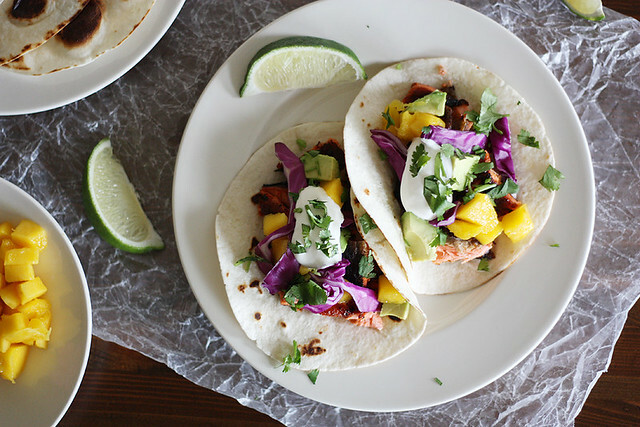 Salmon-mango tacos = PROFESH LANDSCAPING. 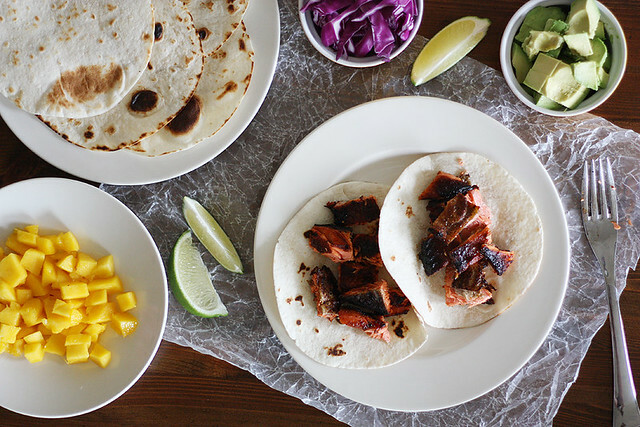 Have you ever had Tex-Mex-flavored blackened salmon and fresh mango together? Better yet, have you ever had Tex-Mex-flavored blackened salmon and fresh mango together in a taco?? I cannot stress enough how magical this combination is in the tastebuds region. It’s like umami overload (my fave) with a hint of sweetness. And then I like to add cabbage on top for the crunchiness and chopped avocado for the yumness. Basically, whatever dose of crazy I have for the day, these tacos help me to chill out (well, that and maybe a margarita on the side). That is a sign of a darn good taco, if you ask me. So if you see me sitting on my lawn staring at a bunch of bushes while simultaneously downing a plate of tacos, you’ll know why. In other news, my husband thinks I’m working on becoming the new Crazy Neighbor Lady. I can’t say I disagree. Heat a large cast-iron skillet over medium heat; add oil and heat until smoking. 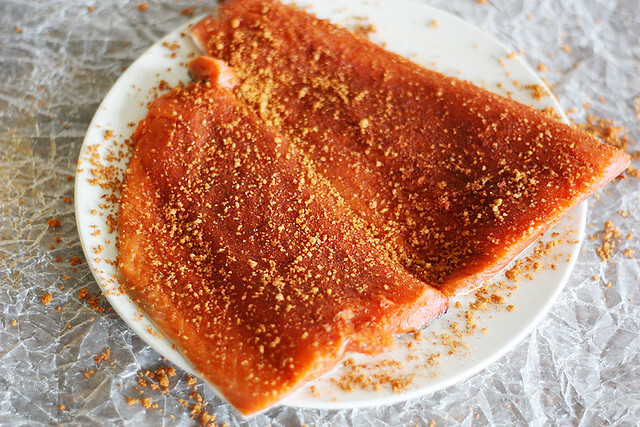 Combine brown sugar, taco seasoning, paprika, salt and cayenne pepper and rub on the flesh side of salmon fillets. Place fillets flesh-side down in skillet; cook 2 to 3 minutes or until blackened. Flip carefully using a spatula and cook on other side until skin is crispy, about 5 to 6 minutes. Remove from heat; chop and set aside. Heat a clean, dry, medium skillet over medium heat. Place one tortilla at a time in warm skillet and heat 30 seconds each side or until charred. Remove from heat and set aside. 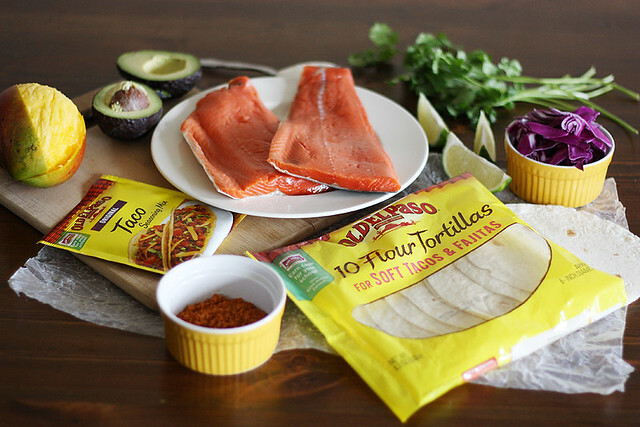 Fill tortillas with chopped salmon, chopped mango, chopped avocado, sour cream, cilantro and shredded red cabbage. Serve warm. Basil it’s terrible indeed! Mine died like eight times, well it wasn’t the very same plant each time, but I purchased like three new plants every weeks just to find out that they were dead the next day. Now is my father who takes care of the plants, and luckily, he’s much better gardening than me lol I’m terrible at landscaping as well. Girl, I wish I could give you some landscaping advice, but I’ve got the blackest thumb in all the land. My husband calls me the Grim Reaper of plants. So… I’ll just wish you good luck and leave it at that! 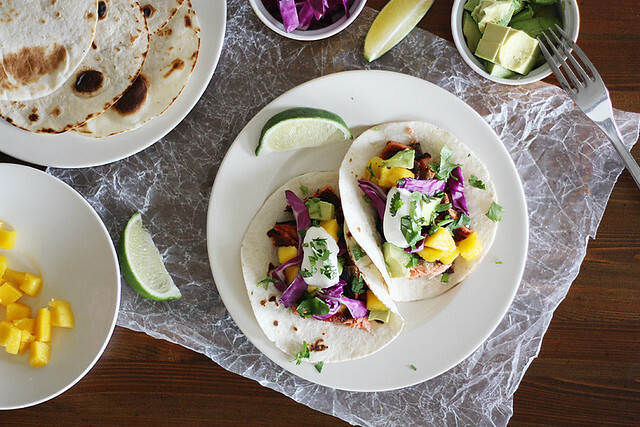 Tacos, I can talk about though – and these look incredible! I love the salmon and mango together… perfect dish to make me hang on to these last days of summer! Dude I totally relate – our previous homeowners had a landscaping company in the family!!!! Needless to say, the yard is gorgeous but I was frightened about keeping up with it!! Too funny. Love this tacos!! We were really scared of our landscaping too… afraid we’d kill everything, but it’s been doing OK so far. Worst thing that can happen — the plants die and we have to replace them with something different! These tacos looks so good! I just pinned them. Ha! The garden gnome figurine reference had me laughing..is it crazy that I want one of those.. We had no choice but to hire a professional to help with our landscaping troubles.. because being a plant in my yard is like being on death row. These are some good looking tacos.. Totally sit on the porch while being a new Crazy Neighbor Lady worthy tacos. Well, we barely have a lawn since most of the year it is covered in snow. So yea, we do not have to worry about landscaping at all. It is kind of nice! Love blackened salmon and the salsa is obviously calling my name! YUM! I have the same problem! We moved into a house with some insane landscaping about a year ago and I have no idea what to do with it. Am I supposed to be trimming things?? How do I kill the weeds but not the “good” plants? I’d much rather just eat tacos. I too dislike the whole landscaping thing. Sadly however, no matter how hard I try to kill what little landscaping I have done to allow me to replace and rework, it always comes back. As to the fish tacos, I was working on the exact same menu (give or take) this weekend. I really like the addition of the mango for sweetness, but I tend to stay away from them as I find them almost too sweet. I wonder if cutting them with some lime and raw onions into a salsa like consistency might work to my advantage? Either way I think its an ingredient I have to start playing with! Thanks for the push. I tried to grow things this past Summer and the bugs got everything except for the jalapeno plant. I can’t keep anything alive. DO not ask me to do anything with home moving or make overs! I am utterly useless! I think the last time I made more of mess in garden and in the house than my parents see as acceptable. Thankfully they both have green thumbs! I might be great at home and garden stuff but this taco is necessary after a long day! Love that colour! Those little irrational fears are pretty nerve wracking (and hillarious) but your fear of the plants dying is exactly why they will thrive! That’s a PERFECT taco if I’ve ever seen one! I have never tried my hand at blackening salmon and now I want to hop to it! Hope you had fun this weekend! Dude, I feel ya! I can’t even keep our herbs alive…hence why we don’t have children! Yikes. Oh, and I’ll take a zillion of these tacos, please?! I love these tacos, and the mango pushes them right over the top! Totally my kind of meal. Love the blackened salmon with the mango…great combo! Love my indoor plants, but managing full on landscaping….not so sure my green thumb would get that job done. These tacos, though….that’s a job I can *definitely* handle! Loving this idea!!! These flavors together sound simply AMAZING!!! I must try ASAP! Consuelo — Ha! I just gave up after the first basil plant knowing I’d probably kill any subsequent ones, too. 🙂 Thanks, dear! Liz — Now that’s what I need — a landscaping company in the family. Then I’d be golden! 😉 Thanks, friend! Irene — I’m totally on a savory kick, too! Thus the tacos. 🙂 Thanks! Lindsay — Right?? I don’t even know if things are weeds or bushes. It’s the worst, haha 🙂 I’d much rather eat tacos, too. Jeremy — Ooooo, lime and raw onions sound like a very good idea to add to these tacos. Let me know if you make them and how they turn out! Salmon is so good and I love that you made tacos with it!! This looks sooo delicious. Seriously, I adore fish tacos, love blackened fish, and the colours are so enticing, I want to dive into my computer. It’s okay if you can’t garden. I can’t either. I prefer to think of my garden and yard as more “natural”, the way God intended it, yeah. That’s my story and I’m stickin to it. As long as you keep making gorgeous meals like this you won’t need to be good at gardening. Gardening, schmardening.. I would be pretty paranoid about the landscaping as well. I mean…one of my friends gave me a pot of orchids and I literally stay up at night thinking about them. What is wrong with use?!? Sigh. I think I need these tacos. For stress eating purposes. And because they look damn good. Wow, I need to get a fancy sprinkler system. It sounds so much better than going around the yard with the hose. These tacos look so good. My husband loves anything blackened, so we’ll be giving this recipe a try in the near future. Tacos = the world’s best comfort food. Laura — Yep, right into the pots! Kind of amazing. Still stress-inducing, though 🙂 Would much rather worry about when I can eat tacos next! I hear you. This summer I planted not a single living thing. Last summer I killed basil, mums, and some pretty potted flowers. I am just not meant to have a green thumb. I agree, it looks pretty but it is soooo much work and patience. 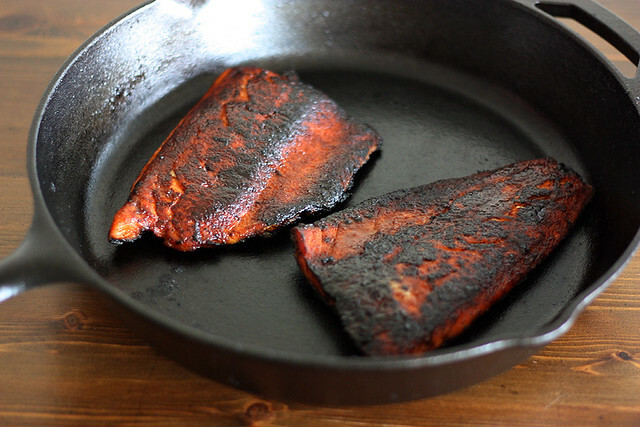 Blackened salmon, now that is something I can do! Love this! Oh my god, I’m the same way. I love my house. Hate the friggin’ landscaping. Or at least I hate having to do it in Austin in August in this horrible summer heat! I save it for the fall. 🙂 These tacos look so scrumptious! I totally feel you! Gardening… landscaping… pah! I’d rather eat these tacos ANYDAY! I love that first photo – it’s gorgeous! Lauren — Thank you so much! The best thing to do with gardening is to take it slow. Start by growing one or two plants from seed next year just to get a feel for how they grow, and it will boost your confidence since you’ll get to see them go from a tiny little nib to a beautiful bushy plant. I recommend growing tomatoes, as they’re generally pretty easy to grow in the summertime. But the tacos!! I have never had blackened salmon before, but my Lord is looks and sounds amazing. I can only imagine the delicious smells that must have been coming out of your kitchen when you made this!